Media Description: The SWOT Payload module consists of two primary components: the Ka-band Radar Interferometer (KaRIn) and the Nadir module. KaRIn takes measurements over ocean and surface water. 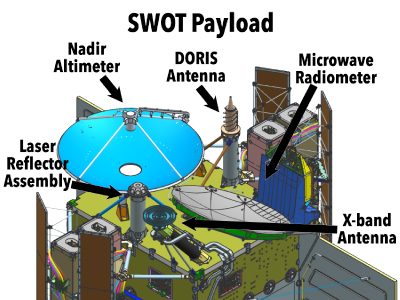 The Nadir module includes an altimeter that will collect data in between the KaRIn swaths, the DORIS Antenna which will communicate with ground-based radio beacons, a microwave radiometer for measuring water vapor, an X-band antenna for data downlink and a Laser Reflector Assembly. Credit: NASA.